Feral cats have become a big issue everywhere. Most people do not know that feral cats being born outside, are better left outside. A lot of states are deciding that killing these creatures is the best way to control overpopulation, but this is not the truth. The HSUS (Humane Society of the US) reports there are over 70,000 puppies and kittens born every twenty-four hours. There just isn't enough homes to adopt them, so these creatures will end up in shelters where their fate will be to kill them. It has been shown that this does not work. Nor does it control the number being born. The only thing that will help this is through spay and neuter programs, TNR (trap, neuter, return). The dog or cat is then retuned to their natural environment to live out their lives free from harm. This is having great promise throughout the world, and S.A.V.E. is asking for your help in this matter. With your help we can save lives and control overpopulation. If you would like to be a part of improving the lives of these creatures, please download our PDF that gives you the information to help you become better informed. You are welcomed to print out the PDF file and post it in your libraries, retail stores, pet stores, vet's offices and any where else you think will help make a difference. For as little as $25, you can sponsor a Feral Cat! 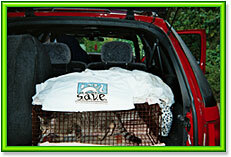 This includes trapping, transporting, surgery (spay/neuter), anesthesia, and rabies shot. If you cannot contribute at this time, tell someone you know who cares about animals to see if they can help! Or you can volunteer your time with trapping and transportation. Never trapped a feral cat before? No problem we will train you on the spot! We want to thank Roxie Video Productions for this video. If more people would either take responsibilities for their pets, these beautiful creatures wouldn't have to pay with their lives.